Don’t look for Part 1 for this post. It does not exist. This was simply my second visit with the surgeon’s office. Pre-op clearance from my doctor. Sleep Study followed up with C-Pap machine. Now that I have completed all of these, I have to get more tests! I can do all of the blood work, urinary test, EKG, PFT, and the pulmonary consult with my primary care doctor. Since I have asthma and pulmonary obstructive disease, I chose as my primary doctor one who specializes in pulmonary illnesses. So, that will make part of the tests easier. I also just had a PFT test when I met with my doctor for the pre-op appointment. I might be able to use those results. I think I can do the Bariatric class and the nurse consult at the hospital on the same day. And I might be able to do the GI Consult and EGD at the same time, but I’m not sure. I have the last pre-op with surgeon’s office already scheduled for October 3. This is an intense process. The nurse I met with today at the surgeon’s office told me they want to make sure that I am as healthy as possible before the surgery. This way, if there are any issues, they can be addressed and fixed before the surgery. Also, I’m sure it covers them if there are complications. They can say, we worked hard to make sure she was a good candidate for the surgery and medically able to handle it ahead of time. This is a good policy as far as I’m concerned. I would rather have everything checked than to have him open me up only to find a problem. So, back to my doctor I go with a list of new tests in hand. Goody-goody. Wish me luck. Today’s kitty-cat picture is one of my sister’s former cats. Her cat had four gorgeous kittens, as evidenced in my previous post where she was seen nursing said kittens. I took two, Yoda and Veruca Salt. She kept her cat, Oscar, and also kept a kitten called Mogwai. He is just beautiful. So, why is he her former cat? Well, let me tell you. She was living with a boyfriend at the time. He kept calling Mogwai his. He fed the poor kitty fresh turkey slices every day as a treat and the cat loved him. My sister’s cat. Loved the boyfriend. When they broke up, she moved out and took both the cats. He then called her every day crying about her taking his cat. The cat in turn, destroyed everything and cried every day. Now this is funny because before she moved in with him, he was an avowed cat-hater. He complained every day that she brought cats into his house. Needless to say, she was confused on the insistence for the cat when they split. So, here he is. 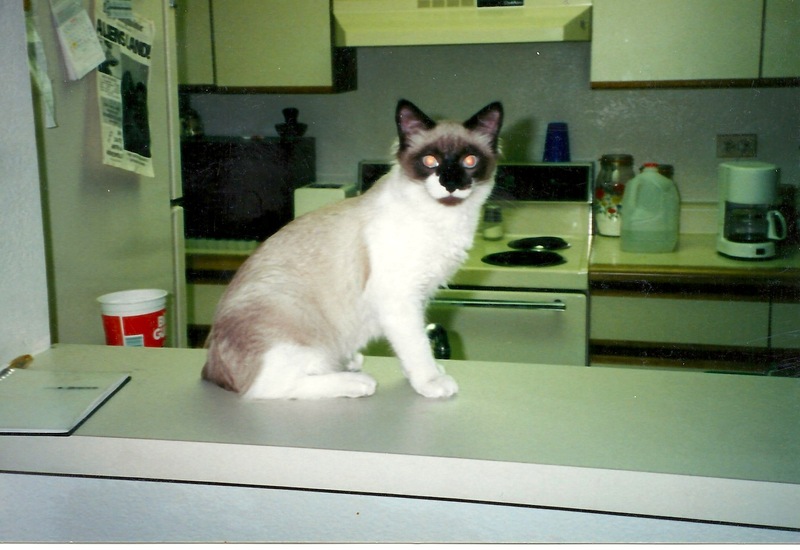 One of the last pictures she ever took of Mogwai…my sister’s ex-boyfriend’s cat. This entry was posted in diet, fat, gastric by-pass, health, life, lifestyle, skinny, Uncategorized and tagged bariatric surgery, cat, fat, fat chick, fitness, health, life, lifestyle, skinny, skinny girl, skinnygirl, weightloss. Bookmark the permalink.